“August 13, 2011: The Iranian regime agreed to provide $23 million to construct a military base in Latakia, Syria following a June 2011 meeting in Tehran between Syrian deputy vice president Muhammad Nasif Kheirbek and Islamic Revolutionary Guard Corps Qods Force commander Qassem Suleimani. Assad says he has now stopped his attacks on these areas, despite evidence to the contrary. See today’s article below. Military and police operations against protesters in Syria have stopped, Syrian President Bashar al-Assad told United Nations Secretary-General Ban Ki-moon, the world body said in a statement. The announcement comes ahead of a UN Security Council meeting on Thursday at which the UN’s human rights chief, Navi Pillay, could call for Syria’s crackdown on protesters to be referred to the International Criminal Court, according to diplomats. In a phone call with Assad on Wednesday, Ban “expressed alarm at the latest reports of continued widespread violations of human rights and excessive use of force by Syrian security forces against civilians across Syria, including in the Al Ramel district of Lattakia, home to several thousands of Palestinian refugees,” the United Nations said in a statement. “The Secretary-General emphasised that all military operations and mass arrests must cease immediately. President Assad said that the military and police operations had stopped,” the statement added. The government’s crackdown in Syria is estimated to have killed at least 2,000 civilians since the protests began in March. 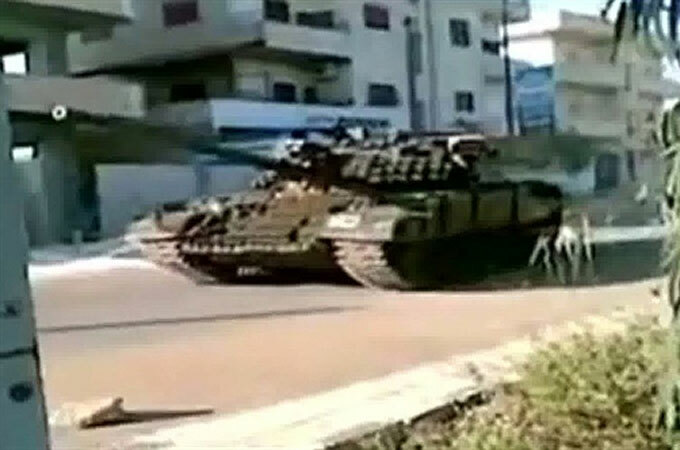 According to activists, Assad has unleashed tanks, ground troops, snipers and warships in an attempt to retake control in rebellious areas. Activists said that security forces were continuing their assaults on the eastern city of Deir ez-Zor and in areas of the coastal city of Latakia, despite state media reports of troop withdrawals. Those reports were also disputed by Ahmet Davutoglu, Turkey’s foreign minister, who said Syrian soldiers were still in Deir ez-Zor and other towns. Dozens of people are reported to have been killed in Deir ez-Zor and Latakia since the weekend. Why should the current turmoil in Syria matter to U.S. interests? (Other than strictly moral issues.) Lots of oil and natural gas sources? Not much there. Those would help explain American business and political interests in many Middle East conflicts, but Syria hardly produces enough for its own use. So why then, should we care if the Syrian government is violently cracking down with mass murderous attacks on its own citizens? Iran and Syria have maintained close ties since the early years of the Islamic Republic and Syria now serves as Iran’s key Arab ally and partner in the region. The advent of the Iran-Iraq War provided Syria with an opportunity to gain another regional ally against Saddam Hussein. In contrast with nearly all other Arab countries, Syria supported Iran during the Iran-Iraq War. In 1982 the two states brokered a deal allowing Syria to receive shipments of subsidized Iranian oil, and in return, Syria shut down Iraq’s oil pipeline through its territory. With the absence of an Iraqi threat since 2003, relations between Syria and Iran have deepened, sustained by their shared support of terrorist organizations Lebanese Hezbollah and Hamas, and their enmity toward Israel. Both Tehran and Damascus have continuously provided Hezbollah with funding, training, materiel, and political support since its creation in the 1980s. According to a 2008 Congressional Research Service report, “Syria is an important interlocutor between Iran and its Hezbollah protégés; Iranian weapons transit through Syria on their way to Hezbollah caches in Lebanon.” Joint assistance for and advocacy on the behalf of Palestinians in the region is also an integral component of bilateral relations between Iran and Syria, with officials from both countries often stridently criticizing Israel on a host of Palestinian issues. The two states also cooperate militarily beyond their support for proxy militias, with the Islamic Republic supplying arms, ammunition and military technology to Syrian security services. In the wake of the Arab Spring, which has led to widespread unrest in Syria and posed a formidable challenge to Assad’s regime, Iranian officials have dispatched IRGC Qods Force advisors, training personnel, and other resources to reinforce Assad’s assault on anti-regime protesters. After a June 2011 meeting between Qods Force Commander Qassem Suleimani and Syria’s Deputy Vice President for Security Affairs Muhammad Nasif Kheirbek, Iran agreed to provide $23 million to Syria for the construction of a military base in Latakia, in order to facilitate direct arms shipments from the Islamic Republic to Syria. Syrian officials have consistently expressed their support for Iran’s right to a peaceful nuclear program and emphasized the need for a diplomatic solution to the dispute. Nuclear cooperation between the two allies, however, has extended beyond rhetoric. In 2011, the UN Security Council Panel of Experts tasked with monitoring sanctions on Iran accused Syria of refusing to cooperate with its efforts. The two cooperated in 2008 in an unsuccessful effort to gain Syria a seat on the International Atomic Energy Agency (IAEA) board of governors. That same year, an Israeli official accused Iran of helping Syria build its own covert nuclear program. The IAEA in 2011 assessed that Syria’s al Kibar facility in Deir al Zour, destroyed by an Israel air strike in 2007, was very likely a covert nuclear reactor built with North Korean assistance. Economic relations between Iran and Syria have remained strong, though neither state contributes significantly to the other’s economy. According to 2008 data, Iran is not among the top thirty recipients of Syrian goods nor is it among the top thirty importers of goods to Syria. An increase in economic cooperation may occur, however, as Syria and Iran are increasingly isolated by the international community. In July 2011 Iran, Syria, and Iraq signed a $10 billion natural gas deal amidst growing unrest within Syria. February 20, 2010: According to Iran’s Press TV, Syrian Foreign Minister Walid Muallem expressed support for a “constructive dialogue between the two parties [Iran and the West] in order to reach a peaceful solution” to the conflict over Iran’s nuclear program. December 3, 2009: Syrian President Bashar al-Assad met with Iran’s chief nuclear negotiator Saeed Jalili in Damascus. Following the meeting, Assad affirmed “the right of Iran and other countries that are signatories to the nuclear Non-Proliferation Treaty to enrich uranium for civilian purposes.” Jalili also held a joint press conference with Syrian Foreign Minister Walid Muallem, in which Muallem expressed Syria’s desire for a “political solution” to the conflict between the West and Iran over its nuclear program. October 1, 2008: Iran abandoned attempts to gain a seat on the International Atomic Energy Agency (IAEA) board in order to support Syria’s bid for a seat. Iranian envoy to the IAEA Ali Asghar Soltanieh made the announcement. July 25, 2011: Iran, Iraq and Syria signed a $10 billion natural gas agreement. According to the agreement, the three countries will construct a pipeline running from Iran’s natural gas fields to Syria, and eventually to the Mediterranean, via Lebanon. Iraq would initially receive 20 million cubic meters per day, and Syria 20 to 25 million cubic meters per day. July 15, 2011: Supreme Leader Ayatollah Khamenei expressed support for a proposal by Iran’s Center for Strategic Research (CSR) to provide Syria with $5.8 billion in aid. May 25, 2010: Iran and Syria agreed to set up a joint bank in Damascus. The initial capitalization of the bank was said to total $30 million, with Iran owning 60 percent of the bank. April 30, 2010: Iranian First Vice President Mohammad Reza Rahimi and Syrian President Bashar al Assad met in Damascus to discuss establishing a regional economic bloc. Rahimi was in Syria to attend the Iran-Syria 12th Joint High Commission meeting. September 22, 2009: The joint Iran-Venezuela oil company VENIROGC announced plans to build an oil refinery in Syria capable of producing 140,000 barrels per day. August 19, 2008: Iranian Minister of Industries and Mines Ali Akbar Mehrabian claimed that the Islamic Republic has “$1.3 billion worth of various projects” underway in Syria. May 27, 2011: Iranian Foreign Minister Ali Akbar Salehi held consecutive meetings with his Syrian and North Korean counterparts, Walid Muallem and Pak Ui-chun, in Bali. All parties refused to discuss the contents of the meetings with the press. July 2, 2010: Syrian Vice President Farouk al-Sharaa and Iranian Parliament Speaker Ali Larijani met in Damascus to discuss events in Iraq and the Gaza Strip. April 18, 2010: Syrian Foreign Minister Walid Muallem met with Secretary of Iran’s Supreme National Security Council Saeed Jalili to discuss regional cooperation. February 26, 2010: Secretary General of Lebanese Hezbollah Hassan Nasrallah met with Iranian President Mahmoud Ahmadinejad and his Syrian counterpart Bashar al-Assad in Damascus. February 26, 2010: Iranian President Mahmoud Ahmadinejad and his Syrian counterpart Bashar al-Assad held a joint press conference in Damascus. During the conference Ahmadinejad asserted that the U.S. desires “to dominate the region, but they feel Iran and Syria are preventing that…. We tell them that instead of interfering in the region’s affairs, to pack their things and leave.” Assad similarly attacked what he termed as the “new situation of colonialism” in the Middle East. January 7, 2010: Syrian Parliament Speaker Mahmoud al-Abrash met with Supreme Leader Ayatollah Khamenei in Tehran to discuss relations between the two states. August 13, 2011: The Iranian regime agreed to provide $23 million to construct a military base in Latakia, Syria following a June 2011 meeting in Tehran between Syrian deputy vice president Muhammad Nasif Kheirbek and Islamic Revolutionary Guard Corps Qods Force commander Qassem Suleimani. March 23, 2011: Turkey’s government seized Iranian cargo bound for Syria. The shipment, which included light weapons, including automatic rifles, rocket launchers and mortars, violated U.N. sanctions that ban the export of arms from Iran. March 15, 2011: Israel’s navy seized a weapons shipment from Syria in the Mediterranean Sea. The contents of the shipment included strategic shore-to-sea Chinese-made C-704 missiles likely destined for Palestinians militants in the Gaza Strip. December 10, 2010: A UN Security Council sanctions committee report cited Iran for two separate violations of UNSCR 1747, including one that involved a container of T4 explosives originating from Iran and destined for Syria. Italian customs authorities seized the container. June 30, 2010: Israeli and U.S. officials reported that Iran had provided Syria with a “sophisticated radar system” capable of detecting a preemptive strike launched from Israel against Iran’s nuclear facilities. October 13, 2009: U.S. soldiers discovered containers of 7.62mm rounds aboard a German cargo ship traveling from Iran to Syria. The shipment was rerouted to Malta under U.S. direction. January, 2008: Cypriot authorities intercepted an Iranian vessel carrying arms bound for Syria. Monchegorsk, the Islamic Republic of Iran Shipping Lines (IRISL)-chartered vessel flying under a Cypriot flag, originated in Bandar Abbas and was reportedly transporting bullet shells, high-explosive gun charges, and other weapons supplies. July 22, 2007: Iranian President Mahmoud Ahmadinejad offered to provide $1 billion in military aid to Syria.